The Village of Valemount is the nearest community to both Mount Robson Provincial Park and Jasper National Park; it is nestled near the foot of Canoe Mountain and is situated right on the divide between the Fraser and Columbia River watersheds. 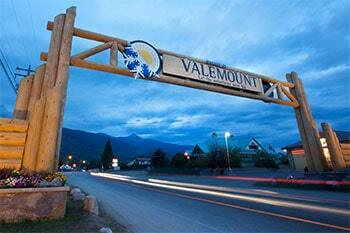 The economy of Valemount is based primarily on tourism and forestry, and services a catchment area of 2000 people. The economy has traditionally been based on forestry but tourism is expanding at a rapid pace. Lovely accommodation options and excellent restaurants are located here to cater to the local population and the travelling public. Locals are wild about locally manufactured goods, like beer, coffee, chocolate and products from the Crafters Guild. The community is full of funky soulful undertakings as featured in our buy local program called Love Valemount. This is a welcoming community. Your children will enjoy the safety of a small community with little traffic, and you will find it easy to make friends here. Recreational opportunities are just outside your backdoor in all seasons. In winter you are in the best snowmobiling country in the world, or if you enjoy peace and quiet and endless powder, opportunities abound for backcountry skiing. Valemount is home to two heliski lodges and a cat-skiing destination. Mountain biking is popular and there are ambitious plans in action for 35 km of new mountain side trails that start and end in Valemount. The hiking and cross country skiing is extraordinary. From September to April, the Canoe Valley Recreation Centre provides residents with opportunities for hockey and skating. Sign up for speed skating or figure skating, or lace up your skates for a public skating session. Health services are provided through the Valemount Community Health Centre. Valemount has both an elementary and high school within its boundaries. Valemount High school has recently established a "Mountain School" with an outdoor/environment-themed curriculum. Fire protection is provided through the local volunteer Fire Department.